I was having a conversation with a family member this past weekend about how I get nothing done with Jane around, because even when she’s sleeping or sitting and playing, I just want to watch her and see what she’s up to. My spying on her has only increased since she’s gotten a bit better at playing with her toys independently. I love to watch her examine them and carefully choose which one to pick up next. It’s fascinating to see her make those decisions and really start to engage and explore them. As if researching baby gear wasn’t a daunting enough task, figuring out what toys an infant might like seemed like yet another topic I needed to investigate. It’s the new-mom rabbit-hole of wanting to know what’s the “best” and what all the other kids are using. I ended up leaning a lot on my cousins and friends with kids to see the things their children played with, and was lucky to receive a lot of Jane’s toys as gifts and hand me downs too. 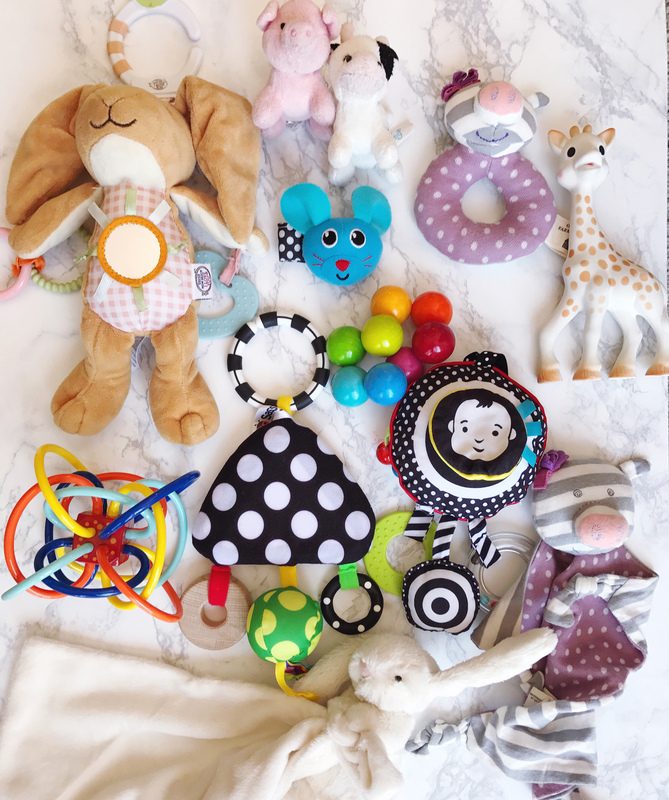 I thought it would be fun to share her favorite first-toys as a helpful guide for other new moms on their research-kick about infant playtime. Soft Toys. The first toys Jane really showed interest in were a few soft toys, mostly because I think they were pretty easy for her to grab onto. She has a few different bunny “lovies” that are all soft and easy to grasp as she started being able to hold things. She especially loves ones that made rattle noises. We also got passed down a set of tiny soft farm animals from my cousins and she adores them. 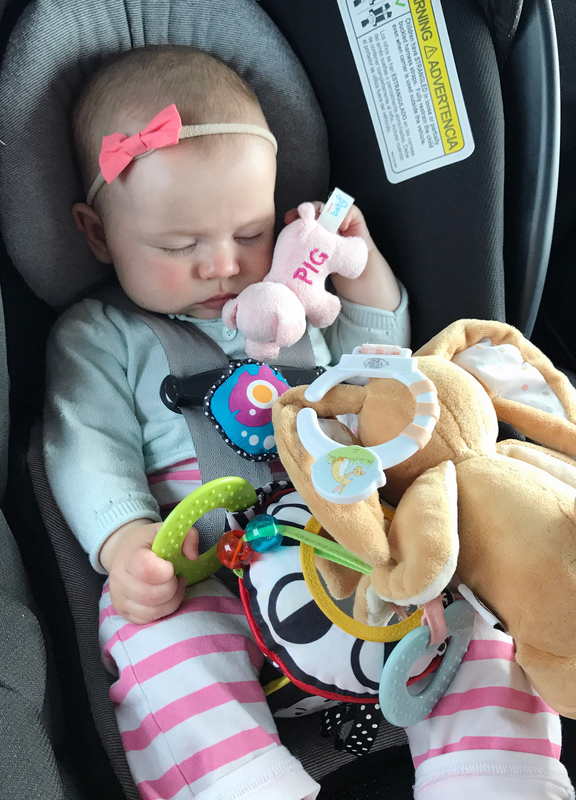 We keep the cow on the changing table and the pig in her car seat and she loves to pop their noses into her mouth and easily holds their small shape. 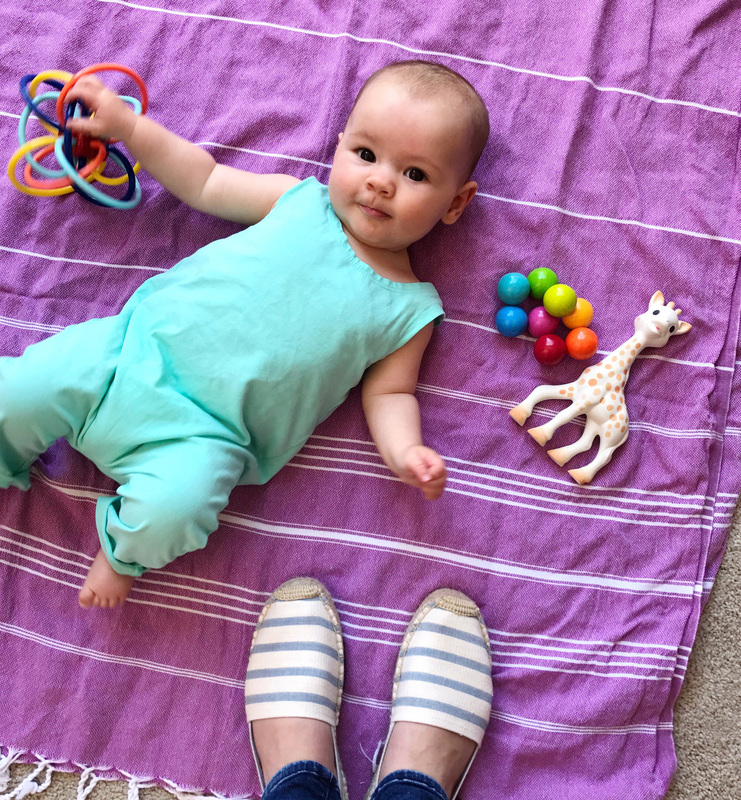 Her absolute favorite toy is what we refer to as “crinkle-bunny” – a soft developmental bunny with ears that make a crinkly noise and lots of teething rings and rattles and tabs for her to explore. I joke that I would be lost without crinkle-bunny, since it’s the one toy that can help her bounce back from a meltdown about 99% of the time. Rattles and Grasping Toys. Once Jane got the soft-toys down, she definitely started to show interest in more rattles and grasping toys. Her first rattle that caught her attention was a wrist rattle with a funny little animal face – it cracked her up! 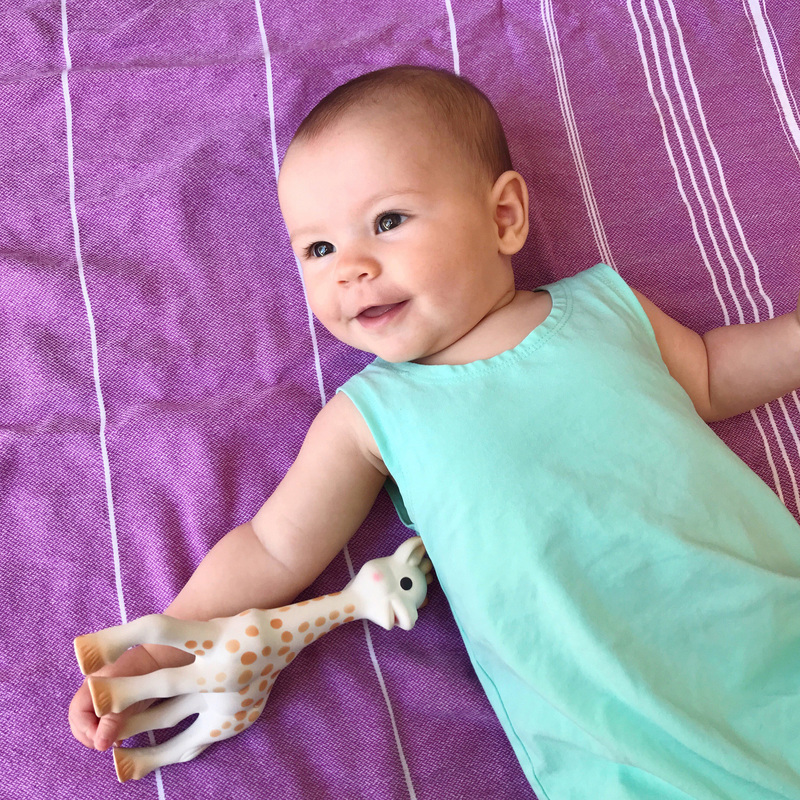 She’ll light up with the noise of most rattles (we love the cute Organic Farm Buddies) and squeaky toys – like Sophie the Giraffe. 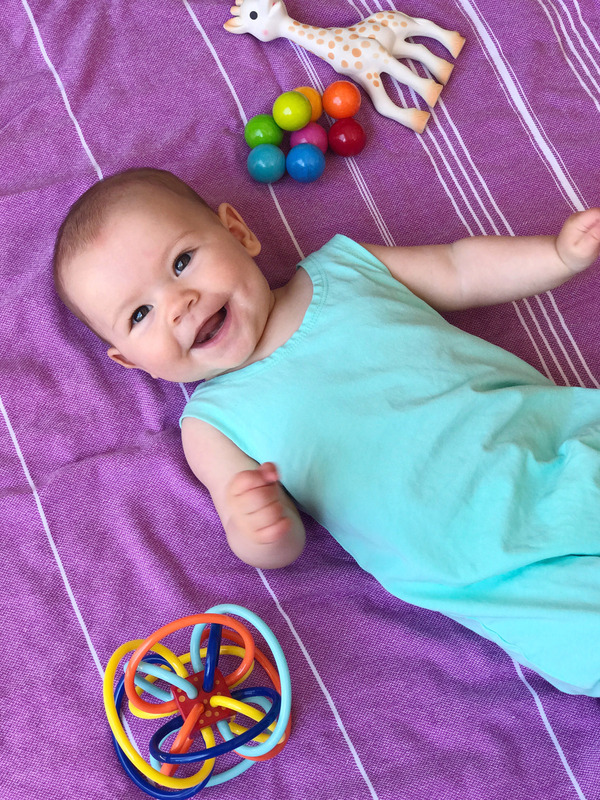 I love the colorful wooden rainbow bead grasping toys because they’re so pretty and now that she has more hand control she’s enjoying this one too – especially the noise it makes. We just added this colorful “winkel” toy to her collection too, she had fun playing with it at a friend’s house and it’s really easy to grasp and chew on. Car Toys. Car toys are essential for keeping any baby entertained when you’re on the move! We usually grab her favorite bunny when we’re heading anywhere for more than a few hours and have a few stroller-specific toys too. The black and white Wimmer-Ferguson stroller toy has been entertaining her before she could actually grasp and play with it. I gave it to her on a recent long car-trip to New York and it kept her busy for a full hour on the ride. My mom also gave her a set of bright link toys and she’s been enjoying those on the go too – plus I like that that they hook onto just about everything so we won’t lose them. Books. I’m so excited Jane is starting to show interest in books too – it’s adorable to see her flip through them with her chubby little fingers. She definitely gravitates towards soft books with the fun crinkly noise in the pages. She also tends to pick up a few of the soft books with stroller hooks on them because they’re easy for her to grab. She’ll paw-through a few of the board books now too – Olivia and Brown Bear, Brown Bear seem to be the ones that are most engaging for her right now. Activity Seats. I posted before that I was so hesitant about bringing giant activity center toys into our house because they take up so much room and don’t exactly do much for our décor. 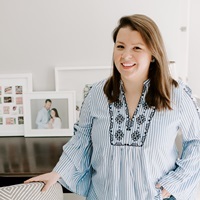 But, they’re a total lifesaver and a great place to pop a baby down to play when you need hands free to do things like work, or if you’re lucky — eat lunch. We have a jungle-themed exersaucer that was passed down to us from a friend and she loves it. I also can’t say enough good things about the Baby Bjorn Bouncer seat. She plays with the toy bar on that seat everyday while I’m in the shower and it’s a lifesaver – I love to pop my head out of the shower and see her chatting with the little spinner toys on the toy bar.